Country houses come in all shapes, sizes, and designs. 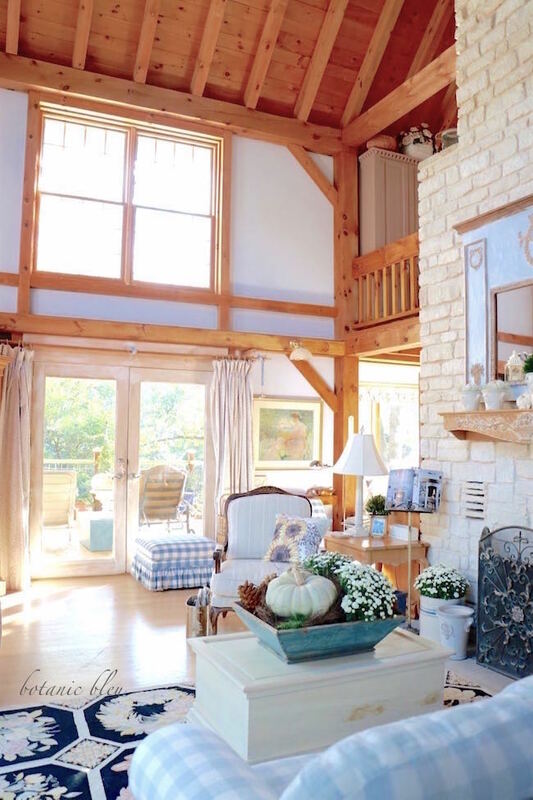 In the beginning our house was more American Country than French Country, but the white cut limestone fireplace in the living room and the pine post and beam structure of the whole house are now more French Country than American Country. One of the most noticeable French style pieces is the mirror over the fireplace that was added about three years ago. Previously, there was not a mirror, but a large print of Chenonceau Château, one of the first additions to reflect French Country. The Chenonceau print now hangs on the back side of the fireplace in the kitchen. Before the Chenonceau print there was a print of American Indians on horseback. American Indians were definitely an American Country western look. 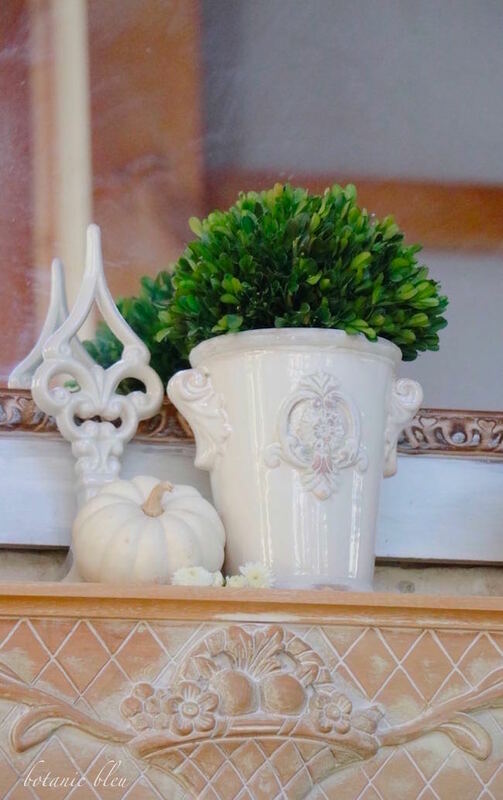 Adding a row of white baby Boo Boo pumpkins and baby's breath flowers in French style pots gives an understated touch of Fall to complement the mirror and the main Fall arrangement in the living room. The large pale green pumpkin and white chrysanthemums on the wooden coffee table take center stage as the Fall stars in the living room. 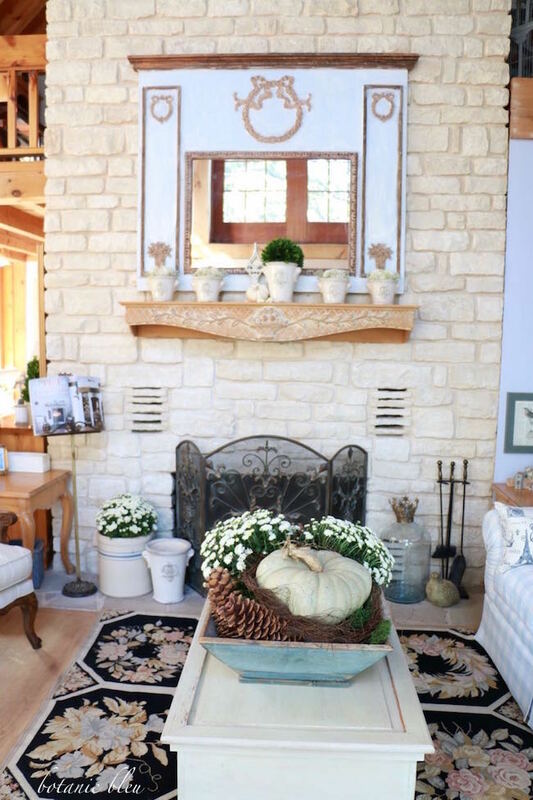 It only takes a few things... a ceramic fleur de lis, a white Boo Boo, and a large French design flower pot... to add both Fall and French design to the carved wood mantel. 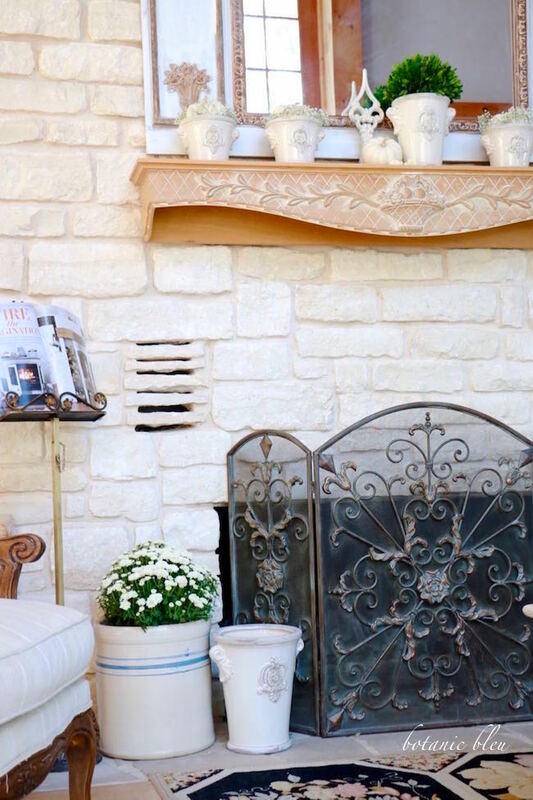 The large metal fireplace screen gives the living room more French Country style than the simpler utilitarian American Country fire screen that it replaced. There are still a few American Country touches in my living room that blend with the newer French Country pieces. 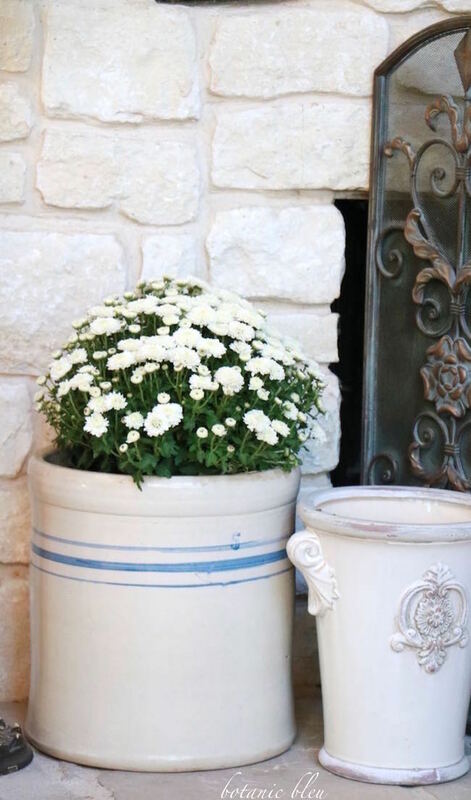 The 5-gallon blue-striped crock is all American Country, and the white elegant scrolled ceramic flower urn is all French Country. 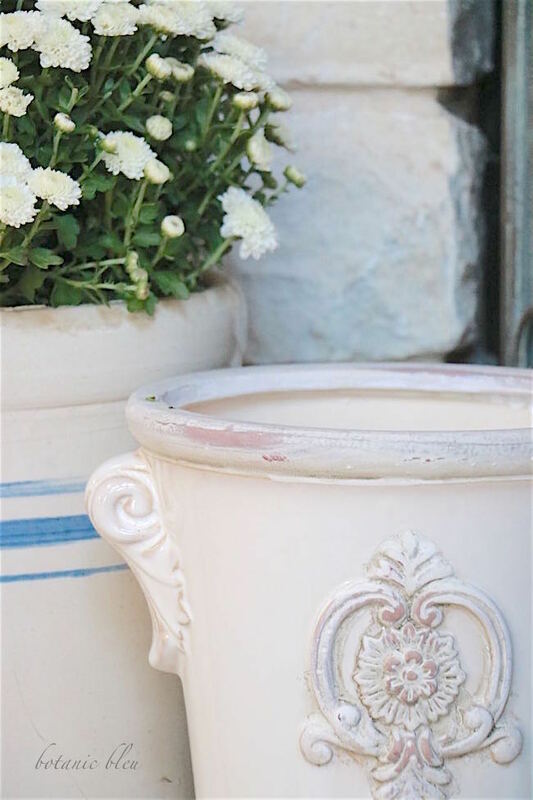 While more French design accent pieces will be added in the future, the old blue-striped crock will continue to coexist with them. 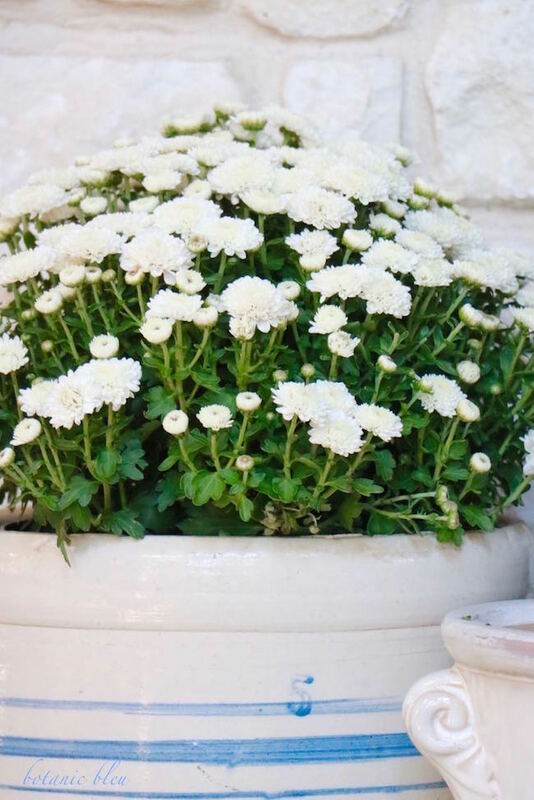 White flowers go with everything, both American and French Country, and fall-blooming mums are a mainstay for Fall decorating. 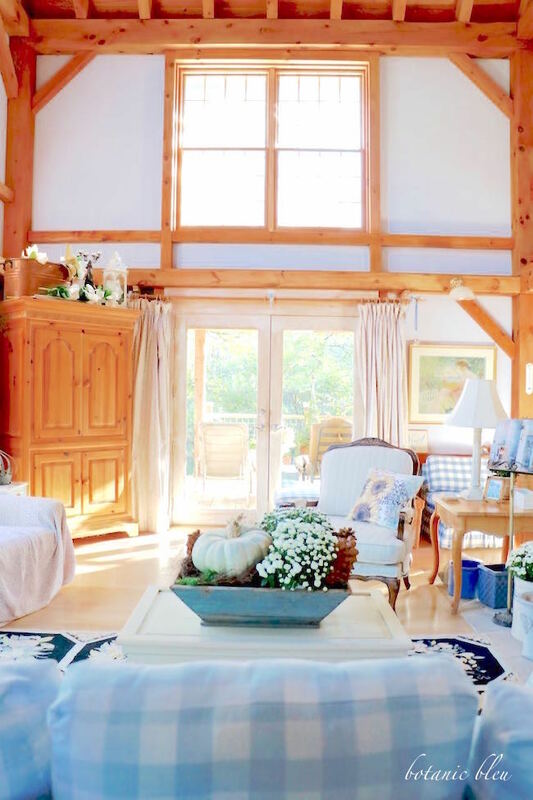 The pine posts, beams, and railings are both American and French Country in design. In the early days in the USA, many farm houses and barns in the northeast were built in the post and beam style that reflected the building style used in countries from which the settlers originated. The Paris hotel where my sister and I stayed this year was built in the post and beam style. The lobby still has an original post in the center of the room with the date 1562 carved with large numbers into the post. In addition to updating the style of the fireplace with its French mirror and fire screen, new pieces of furniture are also French design. The latest new chair in the living room is a French bergère. 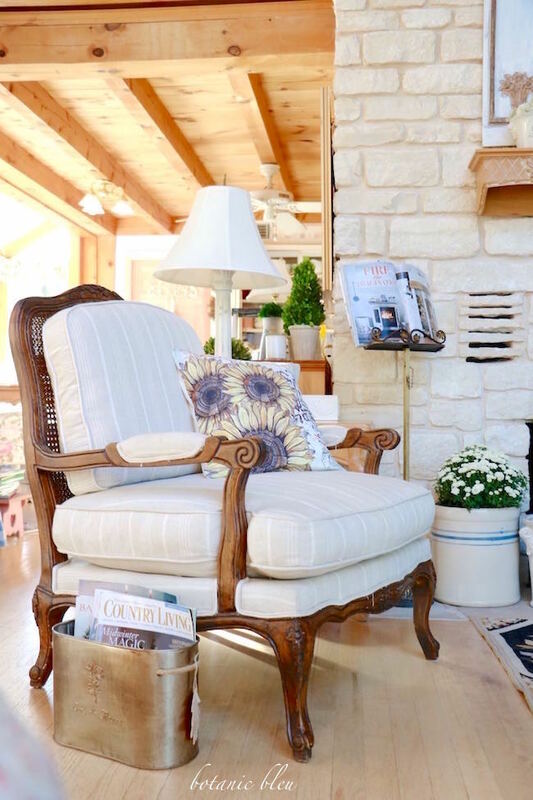 When we first built our house, we had a wingback chair, a classic American Country design, in the living room. 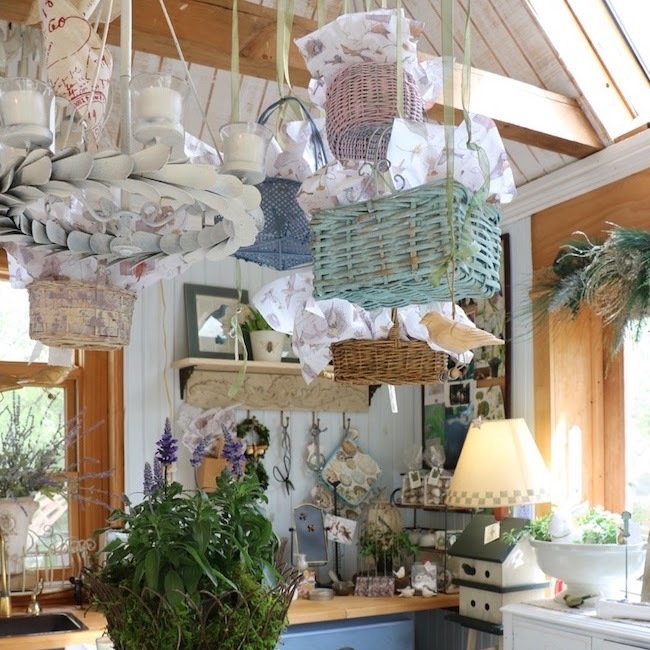 Natural elements, like the wood ceiling with exposed beams in the kitchen, go well with all kinds of country styles including the French bergère. All of the exposed wood posts, beams, and rafters are structural, not just for decoration. The walls do not have standard 2x4 studs; the posts and beams support the walls and house. The house does not have an attic which can be both a good thing and a bad thing. Without an attic the beautiful wood ceiling is visible, but there is also a lack of storage space. Large French doors and windows flood the living room with natural light. In the summer, the sun is high in the sky and barely shines directly into the living room due to a large overhang from the roof. In the winter, the sun is low in the sky, and direct sunlight reaches all the way to the blue and white checked sofa. Fall light shines part way into the living room, and with each passing day will creep closer and closer to the sofa, helping to warm the room during the winter. Also, with each passing day, more French Country will be added when it comes time to update and to replace existing items. 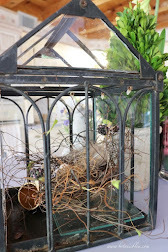 With each new addition, I purposely seek things that reflect French Country design. Want to see more information about our post and beam house? See Post & Beam Dream House for a series of posts. Judith, this is so beautiful. The structure of the house is amazing. I love the way you've decorated too. That bergere chair is gorgeous and the mirror over the fireplace is too. Beautiful house. Everything is perfect together. I so admire the light, airy look of your home, Judith. You've done a stellar job creating a French country ambiance. Looove your home! Beautiful style! I also have that same French mirror! (Although mine seems to be a slightly different shade of blue). Really pretty and I love the French mirror. 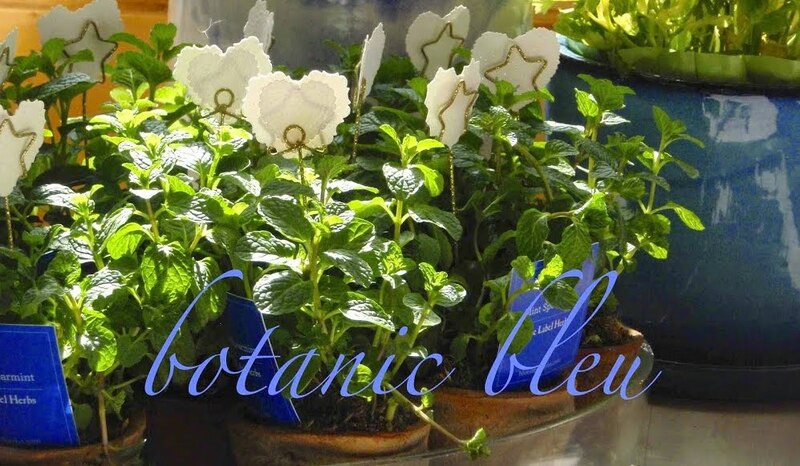 No matter how much French you add I agree with keeping the American blue striped crock because it is just so pretty and anyway it looks quite at home! 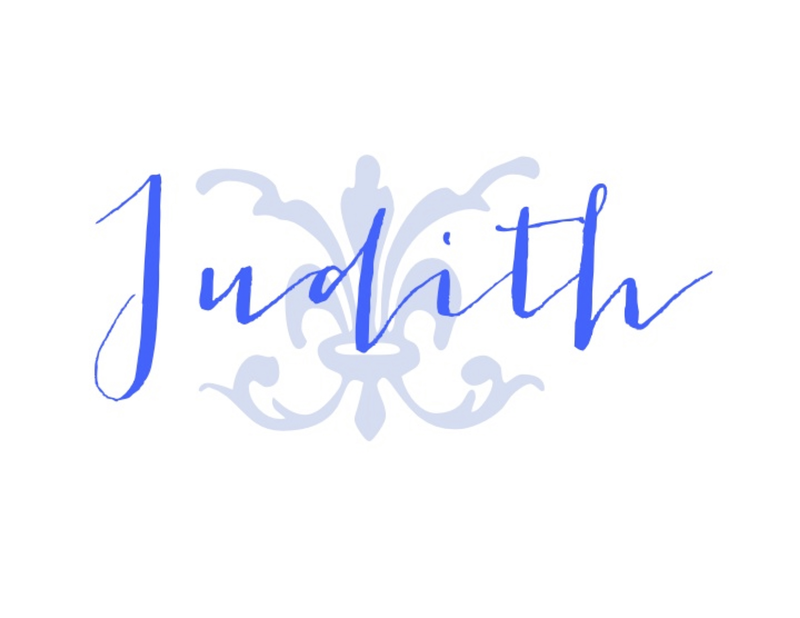 Oh your home is so gorgeous and light, Judith! 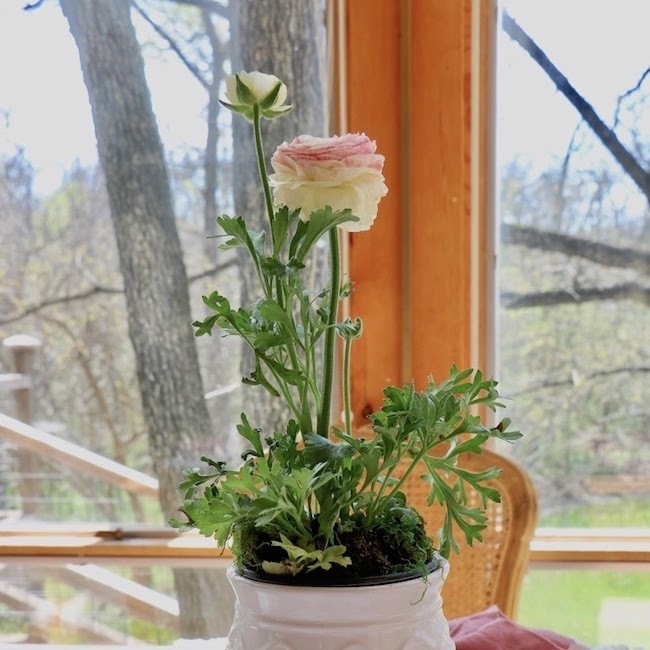 You've managed to balance elegance and comfort in your French Country home. 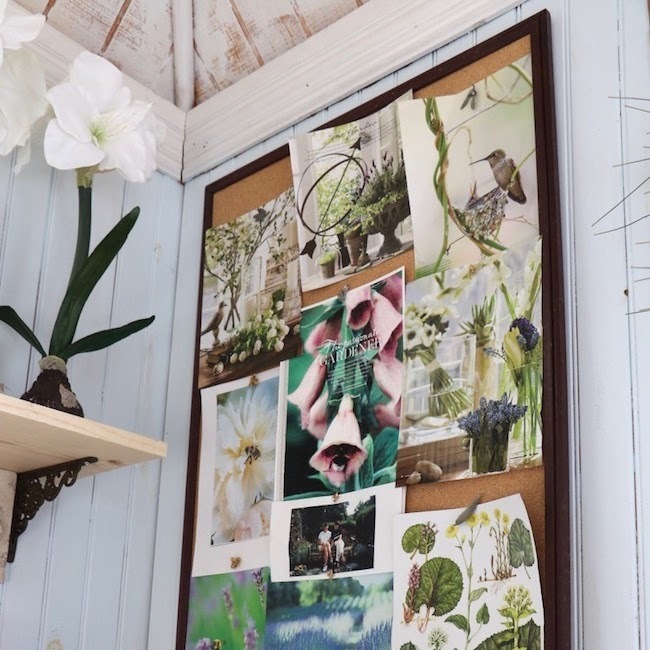 I particularly love the armoire in the last photo. 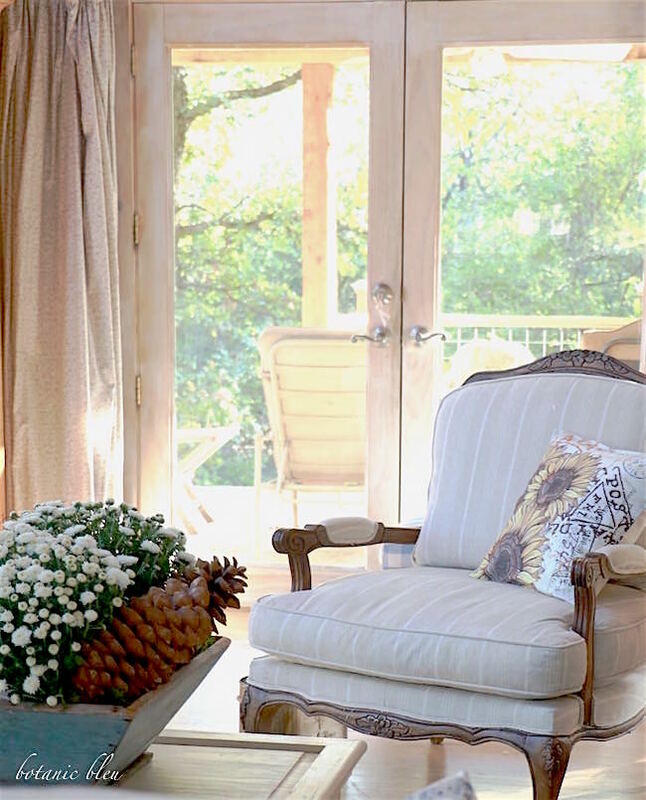 The French doors and the deck beyond are perfect for the room. Beautiful!! Thank you, Marilyn. One long-standing practice is only to buy pieces that are comfortable and can withstand everyday living. The blue and white checked sofa was recovered instead of replaced last year because the frame and pillows were still in great shape AND comfortable. The pine armoire is over 30 years old and was in our previous house. 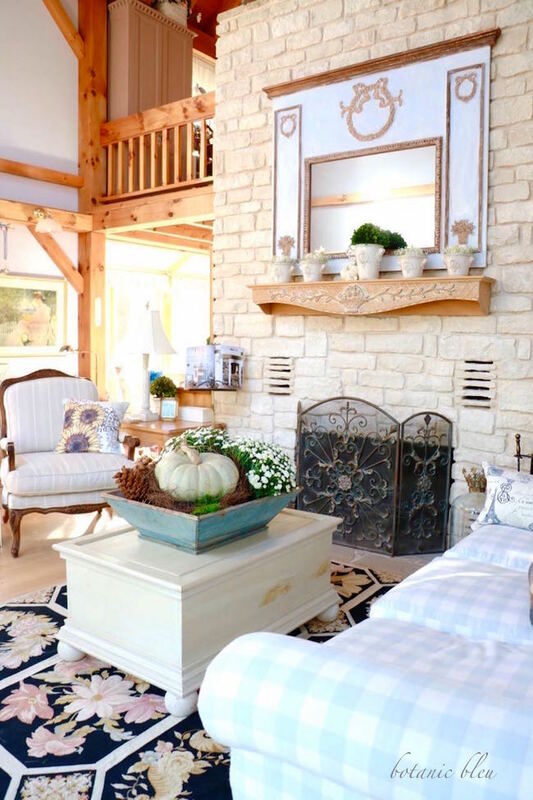 Judith, your French Country living room is gorgeous! I adore your fireplace with the gorgeous carved mantel and stunning French mirror...absolutely beautiful! 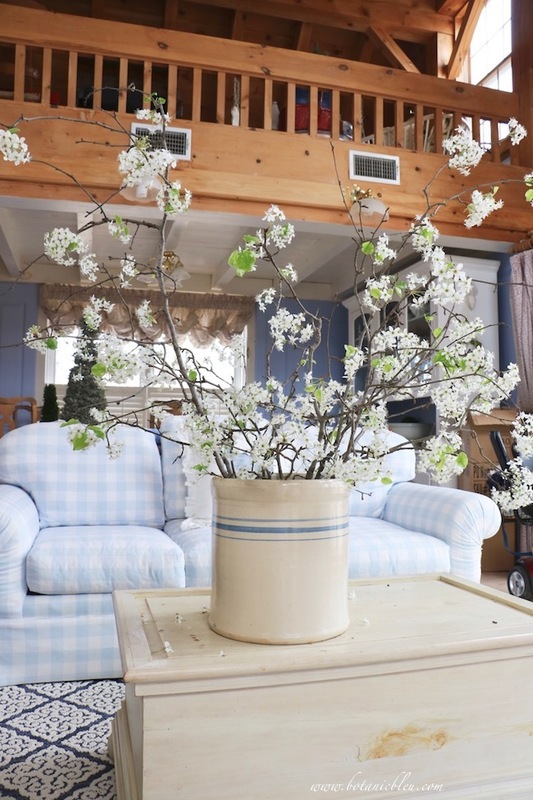 I love all of the touches of blue in the room...so pretty!!! I hope that you have a wonderful weekend!!! Oh my gosh! Your living room is beautiful! You have added more French since the house tour I took a couple years ago. I don't believe I have seen images that have shown how dramatic your ceilings are in this room before. The light. Amazing. 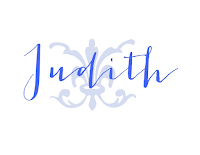 Judith, I love your home. I can tell how much you love it as well by the passion you give it! Have a lovely rest of the weekend. Your room is just gorgeous, and oh my, do I love those beams! I especially LOVE those draperies! Just the perfect touch. Your home is just beautiful. The beams exposed beams give it so much character.